I was extra excited to receive my Paper Pumpkin Kit for March! This month is Paper Pumpkin's Third Birthday so I knew it was going to be extra special! In the video above, I share the contents of this month's kit and give you a few alternate project ideas! This is the card that I share in the video above. I used the stamps from the kit to stamp the background pattern on a Thick Whisper White card base. I stamped the background images using these three ink colors. I cut the included card bases into quarters for the layering piece and wrapped the included bakers twine around it and tied a bow. For the top panel, I stamped the "Happy Happy" stamp and the balloon stamp in each of the three ink colors on one of the included mini cards. 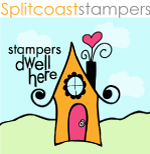 Then I cut the mini card in half and adhered it to the front with Stampin' Dimensionals. I will be sharing a lot more ideas of ways to use this kit here on my blog so make sure to Subscribe over there on the right! I also have a board on Pinterest for every Paper Pumpkin kit, so make sure to check that out, too! Here is the link to my Pinterest Board for March's Kit! If you are not a Paper Pumpkin Subscriber yet, you should sign up today to get in on the fun! If you sign up by April 10th you will start with April's Kit and you won't want to miss it! 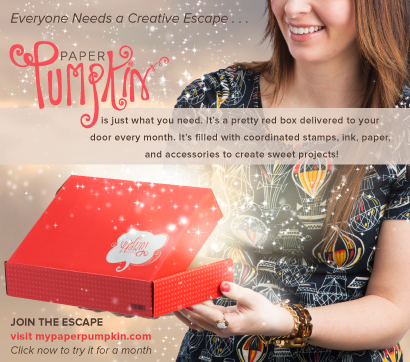 Paper Pumpkin in celebrating their One Millionth Kit and including a FREE Bonus Stamp Set for all subscribers in April! You can Click Here to subscribe on a month to month basis or click one of the images below for a prepaid subscription. There are lots of perks to signing up with me as your demonstrator! You can Click Here to read all about them!